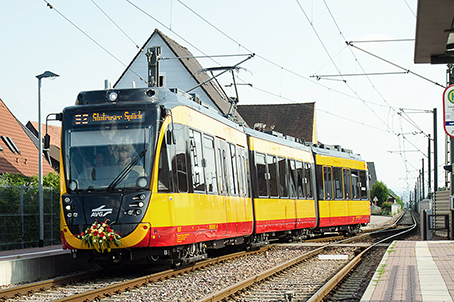 The Verband Deutscher Verkehrsunternehmen (VDV – Association of German Transport Operators) and seven transport undertakings from across Germany and Austria have set up a joint group to procure tram-train LRVs to drive efficiencies of scale for new rolling stock. VDV TramTrain embraces Karlsruhe operators VBK and AVG, Saarbahn, KVG in Kassel, Ems–Neckar Bahn, Regionaltangente West in Frankfurt/Main, and Schiene Oberösterrreich from Austria. The group, led by AVG’s Thorsten Erlenkötter, plans to tender and procure up to 300 tram-train LRVs under a framework contract in 2018-24. Of these, 180 are planned for delivery to VBK and AVG, with four prototypes expected by 2021. The group’s formation brings to fruition discussions dating back to 2009 as German operators noted the disparity when placing orders compared to comparable heavy rail alternatives. VDV TramTrain will now attempt to obtain better value for money rather than each operator placing small orders, which currently come in around EUR6m per car. VDV TramTrain is now preparing specifications for a uniform bodyshell, safety components and traction system, with options for platform heights, door configurations and axle weights to suit each system. There would be a common authorisation process for tram and train operation – Betriebsordnung Strassenbahn (BOStrab) and Eisenbahnbetriebsordnung (EBO). It is estimated that joint procurement could achieve cost savings of EUR1m per vehicle. Once a common platform is established, resulting orders should also be delivered more swiftly, bringing associated time and cost savings, according to Project Manager Mr Erlenkötter. “One can collect common spare parts, consult with common experts, create a vehicle reserve and last but not least strengthen the negotiating position with the manufacturers,” he said. At an early stage the participating undertakings and the VDV consulted with rolling stock manufacturers, who were reportedly enthusiastic about the proposal. It is envisaged that other operators could join VDV TramTrain in the future.